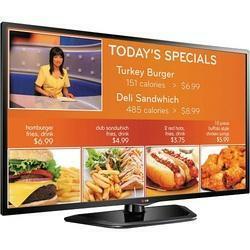 Deliver engaging messaging with versatile professional digital signage for your growing business. Flexible and Professional Business Messaging solution. High Performance and capacity for expanding. Enriched content at a lower cost. Entice and entertain customers with a cost-effective HD resolution LED backlit display that is designed for small shops and small-to medium businesses. Conveniently and easily transfer and manage content from a PC or mobile device with built-in Wi-Fi and provided apps. Promote and inform using included Samsung Magic Info E Player signage software on the display or Samsung E Author signage software on a PC. To keep up with the latest technology trends, smaller businesses are embracing digital signage to more effectively engage and entertain customers. As a unified TV and signage solution, Samsung EBD Series offers an innovative and affordable way to deliver your messages to captivate customers and drive profits. These integrated displays deliver entertaining content through live TV channels, as well as impactful store advertising such as promotions and special events. You can easily create customized content on a PC or mobile device for more flexibility. To ensure you remain productive, durable EBD series provide reliable operation for up to 16 hours a day. Looking for Large Format Display ?